Chef Kit helps you compete with direct-to-home meal kits and provides delicious meal choices for even the pickiest shoppers. Our catalog allows you to select meals based on the latest trends, recipe popularity, your inventory, and perishable ingredients. Chef Kit brings more to the table when it fits your shoppers’ schedules, and your bottom line. We provide the menus, seasonings, sides and liquid ingredients plus co-branded packaging and full cooking instructions. You provide the meat, seafood, produce and other perishables from your store to complete the kit. Sell packets solo allowing customers to pick their own perishables. Meal Kit Packs can be merchandised near the deli or meat sections, or at the front of the store. 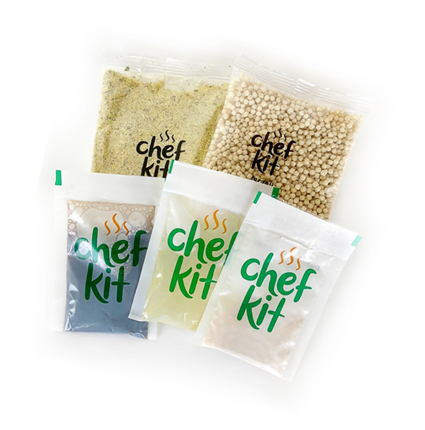 Chef Kit also offers co-branded boxed kits for a more finished look or if recipes use more fragile ingredients. Send us a message using form below, we will send you a link to our wholesale website where all options and kits are displayed and can be ordered directly. The products are organized by popularity so you can see what kits are moving best. This is a rolling national average but it should give you some ideas on what to order. Stores only need to buy one case of Chef Kits to get started. Mix and match kits to delight your customers. Thank you for your interest in Chef Kit.